DBConvert for Excel & MySQL with scheduler feature converts Excel file (.xls) to MySQL and MySQL to Excel spreadsheets. You can save Excel data to PHP script or to MySQL Dump file for overcoming the restrictions on MySQL server. 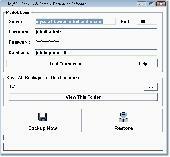 Program Backup Watcher for MySQL is intended for making database backups of the MySQL server. Archiving can be done on the local computer as well as using the remote server in the Internet. EMS Data Comparer for MySQL is a powerful and easy-to-use utility for data comparison and synchronization. You can view all the differences in compared tables and execute an automatically generated script to eliminate these differences. EMS Data Export 2005 for MySQL is a powerful program to export your data quickly from MySQL databases to most popular formats, including MS Access, MS Excel, MS Word, RTF, HTML, XML, PDF, TXT, CSV, DBF and others. EMS DB Extract for MySQL is a powerful and easy-to-use utility for creating database backups in a form of SQL scripts. It allows you to save metadata of all database objects as well as table data. EMS SQL Manager for MySQL is a powerful tool for MySQL Server administration and development. Its state-of-the-art graphical interface and a lot of features will make your work with any MySQL server versions as easy as it can be! Use MS Excel as a front-end interface to a MySQL database. Use Excel to import and export tables to and from a MySQL database. MS SQL to MySQL Sync is designed to synchronize databases from Microsoft SQL to MySQL and vice versa. This data migration tool accomplishes two-way data synching and allows you to configure conversion settings in friendly wizard-like user interface. Vertically merge one MySQL table into another. The tables can be located in the same MySQL database or two different databases. Backup and recover MySQL databases. Backups can be set to occur every 5 minutes, 30 minutes, 1 hour, etc. Transfer tables to and from MySQL and IBM DB2 databases. Importing and exporting can be done without SQL knowledge. Horizontally merge two MySQL tables into one by a common column (field) of data. The two tables are not changed, a new table is created with the results. MS Access 2000 or higher required. . . Remove or replace certain characters, spaces, enters, tabs or user-defined in a field (column) in MySQL using different methods. Remove character(s) at beginning, end or inside by position or by referencing surrounding character(s). Remove or replace certain characters, spaces, enters, tabs or user-defined in a field (column) in Mysql using different methods. Remove character(s) at beginning, end or inside by position or by referencing surrounding character(s). Remove alpha, numeric, alpha-numeric or non-alpha-numeric.